Air Canada is having a St. Patrick’s Day Sale. Planning a trip somewhere in Canada, the U.S. or down south? You’re in luck! 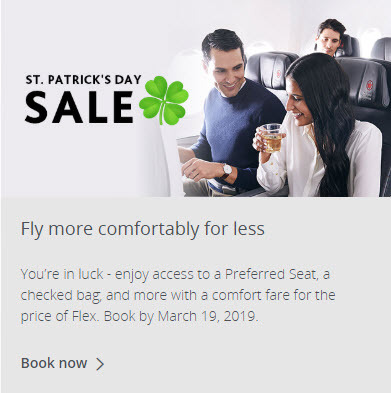 Take advantage of Air Canada’s Saint Patrick’s Day Sale and treat yourself to access to a Preferred Seat, a complimentary alcoholic beverage, early boarding, a complimentary checked bag and more with our comfort fare, all for the price of Flex! You’ll need to enter promotion code STPAT2019 to get the discount. Book by March 19, 2019 for travel until August 31, 2019. Book by March 19, 2019, at 11:59 p.m. from your city of departure in Canada. Valid on Economy Class comfort base fares. Travel valid from March 12 to August 31, 2019. Subject to availability at time of booking. Not valid on codeshare flights. If you need to book a place to stay, check out Airbnb (Free $45 credit), Hotels.com, and Priceline.com. Sign-up for Uber and enter my invite code uberDealsBlog to get $5 Off Your First Ride! Uber is around 30% cheaper then a taxi. VancouverDealsBlog.com is updated daily and features the best and hottest deals, sales, coupons, freebies, discounts in Vancouver, British Columbia, Canada. Save up to 50-95% Off! Join our free daily deals mailing list and never miss a deal again! Copyright © 2010-2019 Vancouver Deals Blog. All Rights Reserved.